We’ve been experiencing some, in my opinion, depressing weather here in Anchorage. It’s been cloudy and rainy with highs only in the 50s. This morning the front page of the newspaper reported it’s the coldest July on record so far. Now I understand most of the country is experiencing record heat, drought and storms. I imagine many people would love a little bit of our weather. Believe me, if we could some how trade a bit of our weather for the Lower 48 and make life a little more bearable for us all, I would! So this morning when the sun made a semi-appearance, the kids and I headed to a nearby park for an hour or so. We then came home to have lunch. We decided to sit out on our deck enjoying the sunshine that had fully arrived. After finishing their lunch 2 out of 3 kids told me they were hot and going inside. Ok, fine by me, I’m going to sit out here and absorb every possible sun ray. When I finished my lunch, I went inside, looked at the weather on my phone and saw that it was 61 degrees F! Yes, my friends, apparently that is now too hot for some of my children. Funny, none of them had any problem going out and riding their bikes later. I’m sure that’s because it was cloudy again by then. What a fabulous day! I dropped the girls off at day camp this morning and then Jack and I started our errands for the day. I remembered that I hadn’t had any breakfast, so I stopped at a local eatery, Terra Bella Cafe. I’ve only been to this establishment once before and that was several months ago. I walked in ready to place my order of coffee and probably a piece of quiche when I looked into their display case and what did I see? KOLACHES!!! Oh my goodness the search is over! They had a pretty decent reindeer sausage kolache. I told the woman working behind the counter how thrilled I was as I hadn’t been able to find them anywhere else. She told me they used to sell the fruit filled kind as well, but they didn’t sell very well, but if I ever wanted any to come in a place a special order. YES!! Now the hard part will be not going in every weekend. Then, this afternoon, I was in a local day spa taking care of some girly stuff and while I was in the waiting area I found a Veranda magazine! Yay! I don’t find decorating magazines around here much. It’s normally fishing, hunting, hiking or fitness magazines with the occasional People thrown in. While I was waiting my turn, I flipped through the pages devouring the pictures of beautiful homes and an interview with Diane Von Furstenburg. I’m savoring the two small treasures I found today. What about you? Any small surprises that made your day? Ok, so I’m not normally a “post more than once a day” kinda girl. In fact, I have trouble posting every 10 days or so. Today is an exception. We have a cow moose and her calf hanging out in our backyard!! Some of my friends have said I need to post more pictures, so here comes my first post that’s pretty much a photo blog. Enjoy! P.S. All photos were taken from inside my house with the zoom on. We’re not messing with that momma moose! I love how the mind works. When I was doing my teacher training, I thoroughly enjoyed my courses on brain research. I’m amazed by how the mind sees something it is unfamiliar with and then tries to place it in the familiar. Today I was driving Audrey, my oldest, to her day camp when I noticed about 150 yards ahead of me on the road the biggest black dog I had ever seen was about to cross the road. Then I noticed how the dog was moving and the rest went something like this… that’s not a dog, it’s a bear!! Now keep in mind this whole event took about 3.4 seconds to happen. By this time, we had caught up with where the bear had crossed the road. I was positive I’d see it on the other side of the road. No luck. That black bear was gone. Now that I’ve safely seen my first bear, I’m hoping next time I’ll recognize it for what it is. The “Outside” is the term used in Alaska for anyplace other than Alaska, particularly the Lower 48. The kids and I have made our first trip “Outside”. I’ve made a few more observations about our life in Alaska. 1. When people ask me where I’m from, I answer Anchorage, Alaska, but I clarify that I’ve only lived there 6 months and I’m really from Texas. I can’t seem to help myself. I guess you can take the girl out of Texas, but you can’t take the Texas out of the girl. I really need to get out of this habit though. People find me much more interesting when I’m from Alaska. They sort of lose interest once they hear Texas. 2. I have become so accustomed to really cold temperatures that now 65-70 degrees Fahrenheit feels amazing and 75 feels almost hot! I just might pass out if the temperature gauge reaches anything over 90. 3. My kids and I have had pants, long sleeves and a coat on for six months now. What does that mean when you’re on vacation and wearing shorts, skirts and short sleeves? It means you’re really white. Our skin almost glows in the dark. Add the sunscreen with the zinc oxide that I put on all our arms and their faces and you might mistake us for Casper the ghost. We’re enjoying the warm weather though – such a pleasant change. 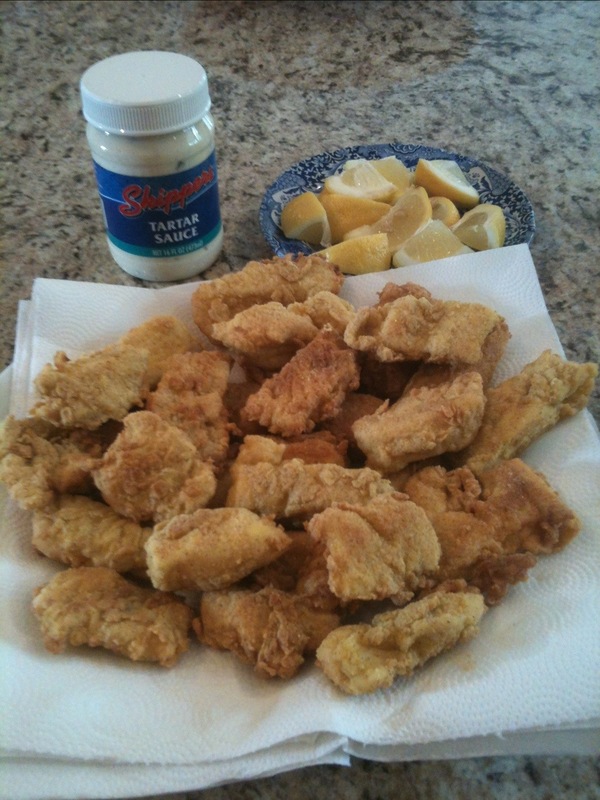 Todd prepared fresh (caught yesterday) fried halibut for dinner tonight with a side of Zoe’s style cole slaw that I made. Zoe’s is a chain of restaurants down South that has an excellent vinegar & oil based cole slaw. Yummy!! 1. Never trust the weather forecast here. Seriously, don’t even bother to look. Just assume it will be cloudy and chilly most of the day. Dress in layers. Be prepared for rain. Pray you get lucky and the sun decides to show itself. When the sun does come out, drop everything and get outside. 2. Roundabouts are awesome. So much better than a traffic light. They’re much more efficient. South Anchorage has several roundabouts and I love them. 3. Nothing smells better than Alaska after a rain. It has to be one of the best smells on earth. Something about the rain makes the cedar smell stand out and it is heavenly. It’s clean and fresh smelling. Just amazing really. I want my whole house to smell that way. 4. Driveway update – all snow disappeared from our driveway Memorial Day Weekend. All snow disappeared from our yard the first weekend of June! No lie! Crazy! 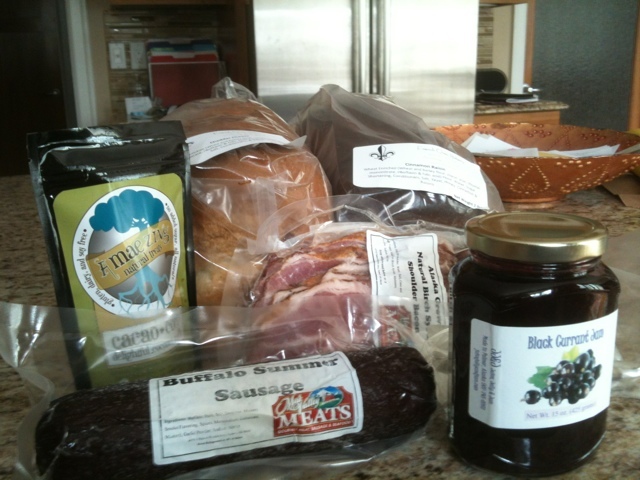 Here’s our haul from the South Anchorage Farmer’s Market today – cheddar cheese bread (makes an excellent tuna fish sandwich), cinnamon raisin bread, cocoa coconut truffles, buffalo summer sausage, bacon and black currant jam. We’ve already dug into the jam and the summer sausage at lunchtime – pb&j sandwiches for the kids and crackers and summer sausage for me. Today was our second visit to the market and it’s an excellent little farmer’s market. I never really dug the Farmer’s Market in Dallas because so much of the stuff wasn’t truly local. This is the real deal though. The jam, jelly and honey comes from the town of Palmer, just north of Anchorage in the Mat-Su Valley. The meats also come from the Valley and the truffles and bread are made here in Anchorage. But really, my favorite part is how nice and friendly the vendors are. They really believe in their products and they want you to love them too. Don, who sells the jelly and jam, lets my kids take way too many samples of his jellies and jelly candies. Mae, who makes the truffles, wanted to know how we’re adjusting to Alaska. I love buying such tasty food from such awesome people. And my kids love going to the market. They don’t love going to the grocery store. I don’t either to be honest. But here, we’re supporting the local economy, we know from where our food is coming and we’re building a new community for our family. We’ll be back all summer long. Sure enough, it was. The epicenter was 3 miles from our house and it was categorized a 4.6. I’ve lived through hurricanes, tropical storms, tornadoes and hail storms, but until today, I’ve never felt an earthquake. Now, I have to admit, I was somewhat looking forward to experiencing my first earthquake. Of course, I normally tried to squash those feelings; my train of thought being, if I want to feel one, we’ll end up having some monster 8.3 quake. Goodness knows that wasn’t what I wanted to experience. I’ll take the somewhat intriguing 4.6 quakes. I’d still rather avoid anything of Hollywood action movie proportions. You know how every donut shop in Texas has kolaches? They may not be good, authentic kolaches, but someone has at least made an effort? Not so here. In the donut shops here you get, well, you get donuts. The first time Todd brought home a box of donuts for the kids I was shocked. Now I’m always slightly disappointed when I open the box of donuts. 1. We do not eat donuts on a regular basis. This is like a once a month treat. We don’t eat that unhealthy every day or weekend. 2. In this case, when I say kolache, I mean the sausage filled kind. Yes, I know that technically the sausage or meat filled ones are called klobasneks, but in my house growing up kolache could mean either the fruit filled or meat filled pastry. I know I’m using the incorrect term. I also know I’m not the only Texan doing so. So, no kolaches here. I never would have guessed that was a regional thing. I’ve heard there’s a European deli here. Maybe I’ll check that out soon. Even if they don’t have them, maybe they’ll know if there’s a Polish or Czech bakery hidden somewhere. If that doesn’t work out, perhaps I’ll have to figure out how to make them myself. In the meantime my fellow Texans, I’d forever be in your debt if one of you could figure out how to get me some kolaches from the Czech Stop Bakery in West, Texas. Cherry with cream cheese and a spicy with cheese, please. Thank you!